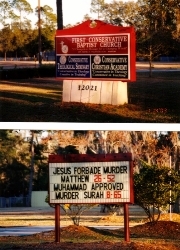 NEWS OF RELIGIOUS CONFLICT & INTOLERANCE DURING 2003-JAN.
2003-JAN-16: FL: Conflict over church marquee: The First Conservative Baptist Church of Jacksonville, FL, placed the following message on their road-side display: "Jesus Forbade Murder, Matthew 26 52, Muhammad Approved Murder, Surah 8 65." The latter is a quotation from the Qur'an, which Muslims believe is God's word, dictated to Muhammad by the archangel Gabriel. The Council on American-Islamic Relations (CAIR-FL) called on religious leaders in that state to repudiate the sign. CAIR-FL Executive Director Altaf Ali said: "All Americans must band together to condemn hate speech designed to divide our nation along religious and ethnic lines. Any attempt to marginalize or vilify one religious community is an attack on all people of faith." The CAIR news release mentioned that: "...CAIR-FL sought dialogue with the church about the display, but that attempt at outreach was rebuffed with belligerent language." Imam Zaid Malik, spiritual leader of Jacksonville's Islamic Center of Northeast Florida added, "Misinformation must be rejected by all people of conscience." 2003-JAN-29: Ireland: Landmark settlement against Roman Catholic Church: The High Court in Ireland ordered the Archdiocese of Dublin to pay �300,000 (about $ in U.S. funds) to Mervyn Rundle a victim of clergy sexual abuse. In another case, an Irish businessman, who claims that he was physically and sexually abused in school, is launching a similar lawsuit. He said: "The Mervyn Rundle settlement has given us added impetus. There is a danger that the Church could move assets abroad like they tried to do in Canada and Boston. We don't want that to happen." He made reference to another 150 cases that are currently being pursued in Dublin, and to thousands more nationwide. Survivors of Child Abuse (SOCA) has called for the government to revoke the charitable status of the Church. Spokesperson John Kelly said freezing the Church's assets and revoking charitable status would compel the hierarchy to co-operate more fully with abuse cases. Kelly said: "Despite all that's gone on, the Church is still in denial; either Ireland rules or Rome rules." "FL religious leaders asked to repudiate anti-Muslim church sign," CAIR, 2003-JAN-16, Islam-Infonet news release.